The Salesforce1 mobile app will change the way you do business. In fact, it’s already transforming users’ lives—enabling them to manage sales, service, marketing, IT, and internal business operations from anywhere, at any time. 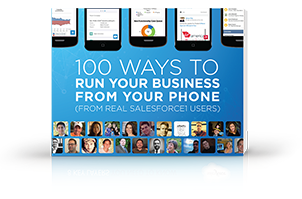 We asked 100 Salesforce users to show us how they run their business from their phone, and they responded with a wave of #Salesforce1selfie screenshots. Salesforce users everywhere have been using #salesforce1selfie to show how they run their business from their phone with the Salesforce1 mobile app. Thank you to everyone who shared their examples. Here are 100 of the best so far.